This will be a fun edition of the Toronto Personal Injury Lawyer Blog. First, we would like to congratulate our founder and directing lawyer, Brian Goldfinger, on his recent naming to the Legal Elite for 2016 by London Business Magazine. The Legal Elite recognizes the brightest and best legal minds in London, ON and Southwest Ontario. This is Brian’s second consecutive year being named to the Legal Elite. We are glad to see all of Brian’s hard work representing injured accident victims and disability claimants getting some fantastic positive recognition in the community. 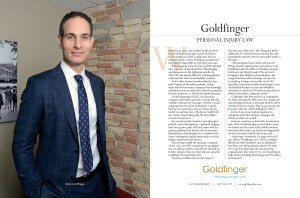 None of this could be accomplished without the hard work from the team of hard working lawyers, law clerks, rehabilitation professionals and support staff at Goldfinger Injury Lawyers which have helped Brian fight on behalf of his clients. A big thank you to everyone behind the scenes for making this award possible. 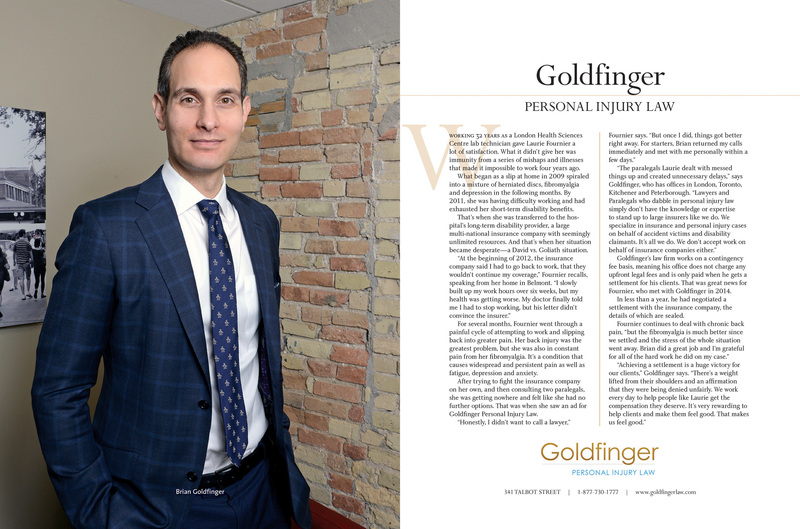 Here is a link to the feature article on Brian Goldfinger being named to the 2016 Legal Elite by London Business Magazine. Brian Goldfinger and some team members from the Toronto Injury Lawyer Blog had the privilege of getting a sneak peak at the exhibits and new vehicles being released at the 2016 Canadian International Auto Show at the Metro Toronto Convention Centre. We had a chance to get in behind the scenes before the general public. Why this attendance was important for the Toronto Injury Lawyer Blog is because a lot of the work we do is on behalf of those who have been injured in, or by a motor vehicle (Car, Truck, Motorcycle, SUV). The advance in technology and safety are important to our readership and to our clients a like. SAFETY SAFETY SAFETY: The advances in safety are astounding. In years past, 4 wheel drive used to be an expensive option. Now, it four wheel drive isn’t standard (Subaru, Jeep, Audi), the cost is minimal such that purchasing the option is a no brainer for somebody looking to drive on Ontario roads which can get cold, snowy, damp and slippery. ABS systems are all pretty much standard now; whereas in the past they were expensive options. Driver side and passenger side air bags are the same. They are the norm on pretty much every vehicle we saw, which is impressive when considering how far these vehicles have come. Taking safety one step further, we have other great advances that are all pretty much standard in many vehicles. Lane departure warning, rear view and front view cameras, warning sensors around the entire vehicle are becoming the norm; whereas before they were exceptions. The technology discussed here is preventative technology. What happens when you get in to a car accident. At Hyundai, they were bragging that the metal produced in their vehicles is made/forged right here in Ontario! They boasted that their metal was the strongest and the lightest found on any vehicle on the road today, such that if you were involved in a car accident with any of their 2015 or 2016 motor vehicles, you would be safer because their metal was better than the competitors. At Volvo, they boasted that they put their vehicles through the most stringent and extensive safety tests on the market today. This has earned Volvo countless safety (and performance) awards. The new Volvo XC90 was named North American Truck of the Year, and Vehicle of the Year by Motoring TV; and one of those reason were the outstanding safety features this vehicle boasts. LIGHTER, FASTER, STRONGER: In an exclusive interview with the Toronto Injury Lawyer Blog, a CEO from one of the major Japanese Auto Manufacturers suggested that his company’s vehicles, were, on average, 15-25% lighter than they were 10 years ago; but the materials were just as strong, if not stronger than they were in that same time period. This means greater fuel efficiency and also translates in to driving a safer vehicle. The lighter the vehicle, the less weight behind the impact. And if two vehicles which collide are lighter, but just as strong, the damage to the passengers will not be as severe compared to a collision between heavier vehicles. DRIVERLESS CARS One of the biggest trends you may read about in the news is the push towards the driverless car. We see that Google, Apple, Microsoft, Ford, GM etc. are all working hard to get driverless cars out on the road. We can tell you that this theme was virtually non existent at the Canadian International Auto Show. Some CEOs and auto executives certainly discussed it, but when it came seeing any sort of technology on display, or making a formal announcement on the topic, there was silence. What impact will this technology have on the field of personal injury litigation and car accident law? We have yet to know, and I suspect we are a decade or so from finding out. PEDESTRIAN SAFETY Cars hitting pedestrians is common. Many of our clients have been seriously injured while trying to cross the street on foot. Many of the auto manufacturers at the show had their own pedestrian detection technology such that the vehicle could detect a pedestrian in front of the vehicle, and slow down, stop or beep to warn the driver to avoid an impending collision. The best and most advanced system we saw was probably that of the BMW Night Vision with Pedestrian Detection, or Subaru’s EyeSight Technology. Both were impressive systems that will help reduce motor vehicle/pedestrian collisions for years to come. With time, these technologies will become better, more affordable and more common. ELECTRIC CARS: The theme of electric cars and hybrid vehicles is now the norm. It seems that every vehicle on display had some sort of alternative engine or “Eco” mode available on it. For example, nearly every Honda, it it wasn’t a Hybrid vehicle or some sort; had an “Eco Mode” or “Eco Button” the driver could press to improve fuel consumption. These trends are fantastic for the environment and for our pocket books when it comes to save money on gas. It was an absolute honour and a privilege to get a sneak peak at the displays and vehicles at the 2016 Canadian International Auto Show. We encourage our readership to check out this year’s show in Toronto. It’s well worth the drive if you’re coming in from out of town. This year’s show has something for everyone and has taken a leap towards being one of the world’s premier auto events. Having seen shows in LA and Detroit, this year’s show is getting up there and is nothing to slouch over.